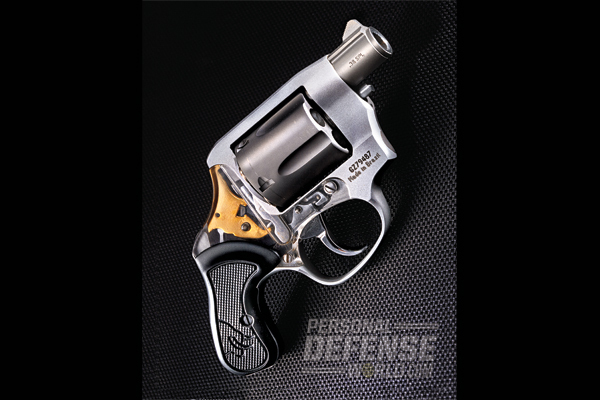 The Taurus 85 View offers eye-catching looks, carry-friendly dimensions and no-doubt .38 firepower! 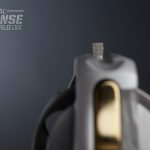 As its name denotes, the Taurus 85 View features a translucent Lexan sideplate that allows you to see the internal workings of the double-action trigger mechanism. 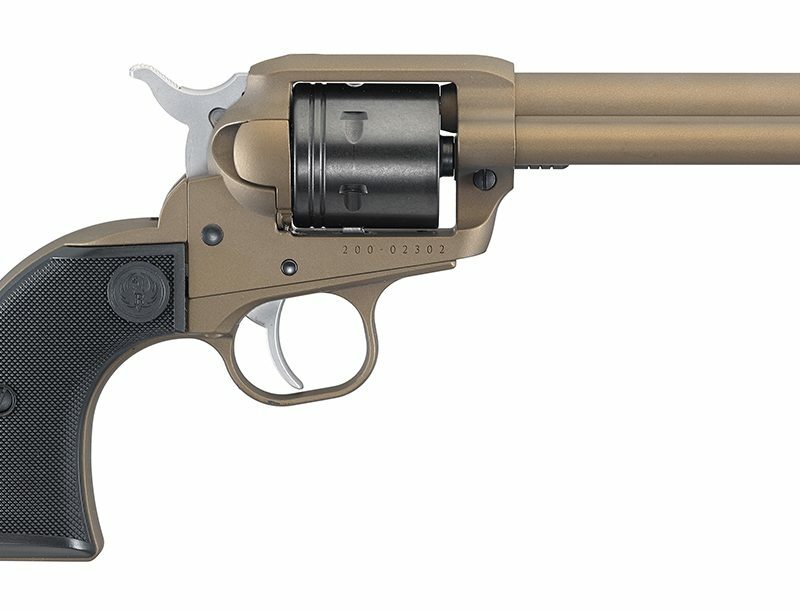 As practical as it is unique, the View is one of the lightest and smallest .38 revolvers on the market today. 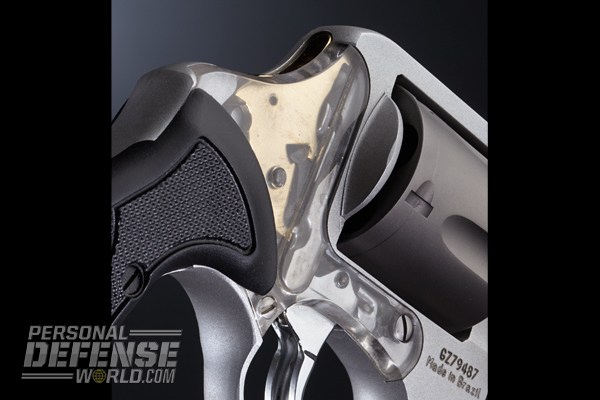 The View’s Lexan sideplate is strong enough to serve as an integral part of the revolver’s frame. Pressing the View’s short ejector rod pushes cases partially out of the chamber. The View has a spurless hammer and uses a transfer-bar ignition system. 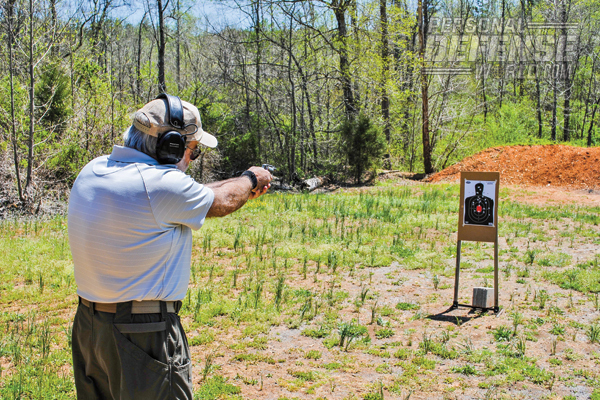 Befitting the View’s intended uses, off-hand testing was conducted at 3 and 5 yards. Snappy but manageable, the View produced well-centered groups measuring roughly 3 inches. 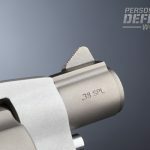 The View’s titanium barrel has a rifled, stainless steel liner. 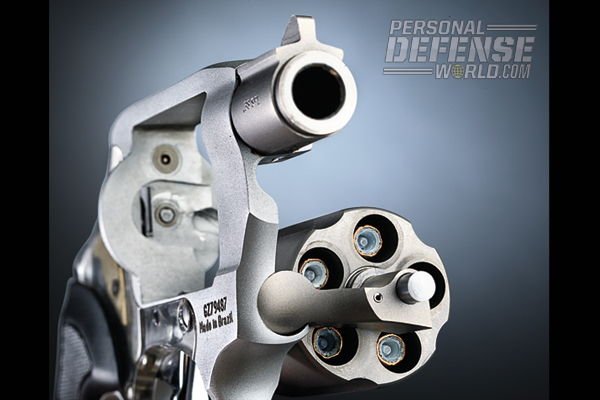 Have you ever pondered what happens when you pull the trigger of a double-action (DA) revolver? If you haven’t, let me describe it for you. 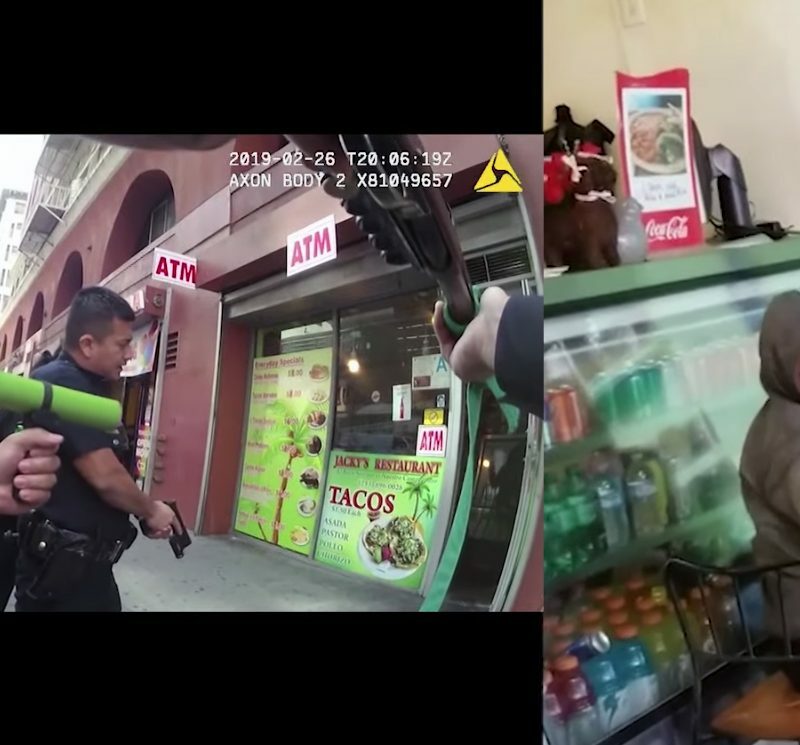 As the trigger is pulled, a lever pushes the hammer backward. 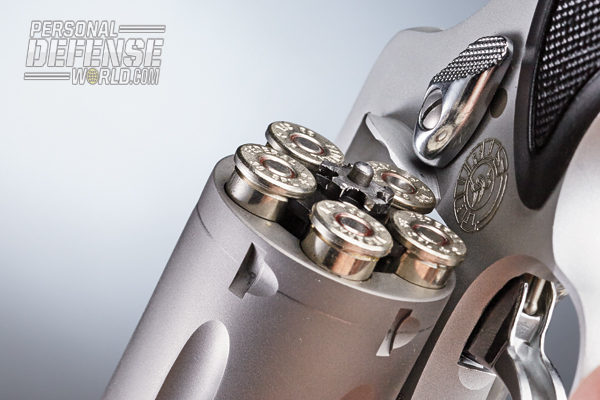 As it moves backward, the hammer compresses the mainspring in the grip frame. 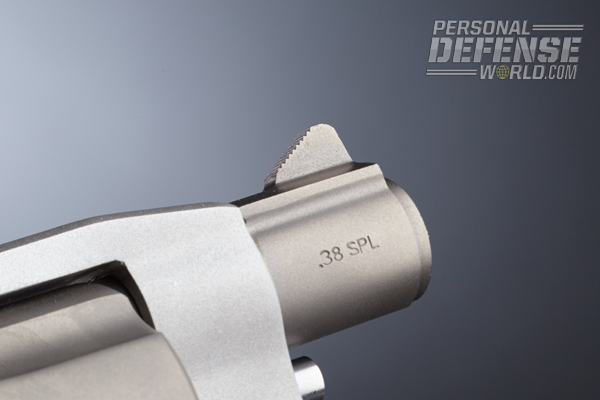 At the same time, a pawl attached to the trigger pushes on a ratchet on the rear of the cylinder, rotating it to position the next chamber behind the barrel. 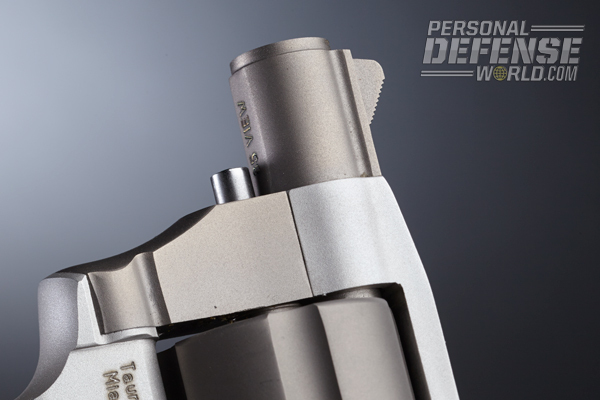 Another pawl engages a small depression on the cylinder, locking the cylinder in a position so it is perfectly lined up with the barrel. At the end of its stroke, the trigger releases the hammer, which the compressed mainspring drives forward to ignite the cartridge. 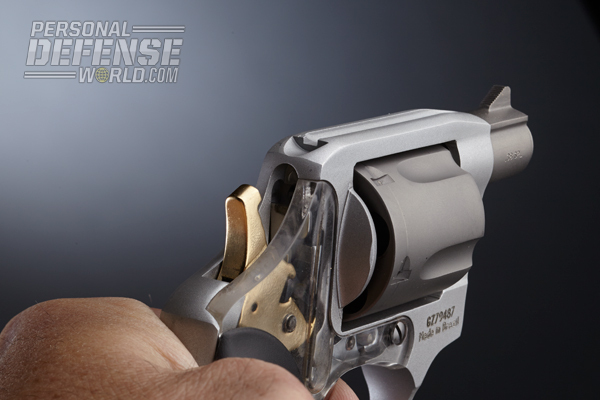 The reason that most of us don’t give this operation much thought is that the revolver’s lock work is fully enclosed inside the frame and, except for the hammer moving, is invisible to the shooter. 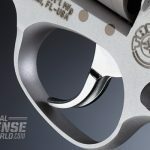 Well, for the inquisitive among you, there is now a revolver with which can see everything happening on the gun’s inside every time you pull the trigger—the Taurus 85 View. 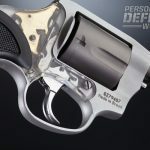 The barrel—which has a rifled, stainless steel liner—measures a mere 1.41 inches in length, which, I believe, is the shortest of any current production .38 Special snubbie. And do you see that little thing sticking out under the barrel? That’s the ejector rod—a very short ejector rod. Pushing on it partially extracts spent cases from the cylinder, after which they must be pulled out manually. 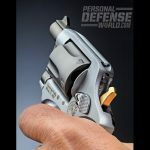 While some might see this as a shortcoming, it should be remembered that the concept of the Taurus 85 View is that of a small handgun that will only be used at very close range in the most desperate situations. 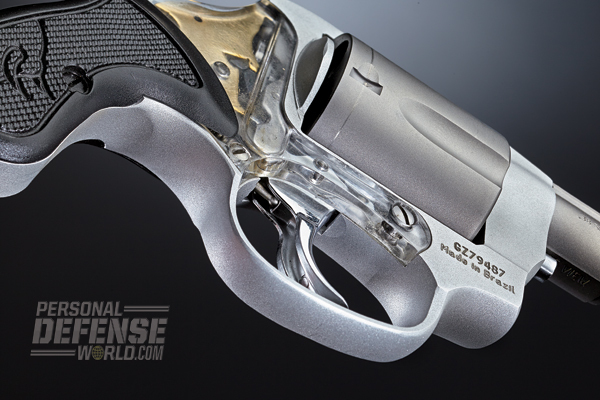 It’s very unlikely that you’ll be performing any speed reloads with it. 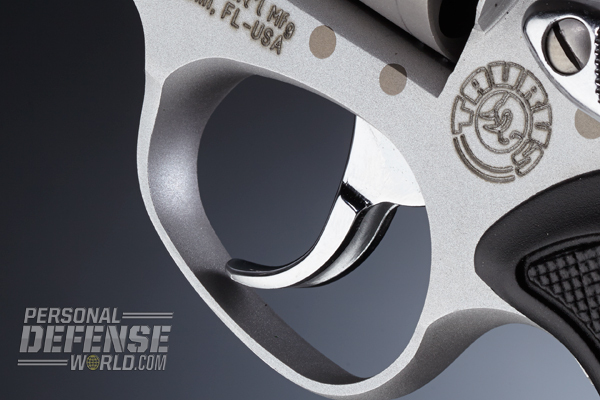 Thanks to its small size and alloy and titanium construction, the Taurus View has an unloaded weight of around 9 ounces, making it one of, if not the, lightest centerfire handguns on the market today. 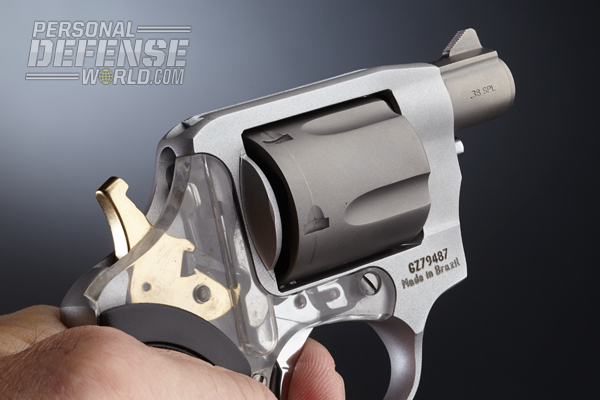 Like all Taurus revolvers, the View has a transfer-bar ignition system. 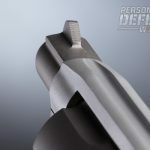 When the trigger is pulled through a full stroke, a bar is raised in front of the firing pin that the hammer strikes when it falls, pushing the frame-mounted firing pin forward to ignite the cartridge. 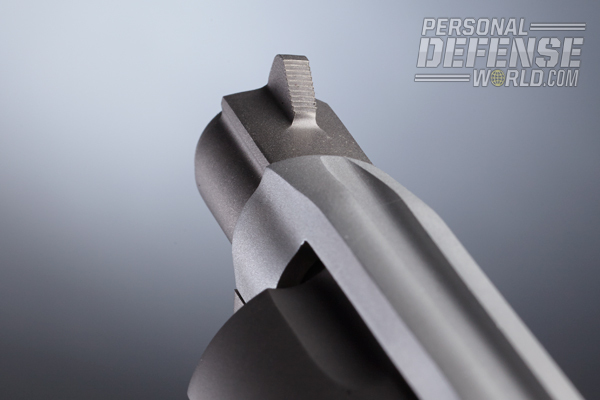 At all other times the hammer rests on the frame, where it cannot impact the firing pin. 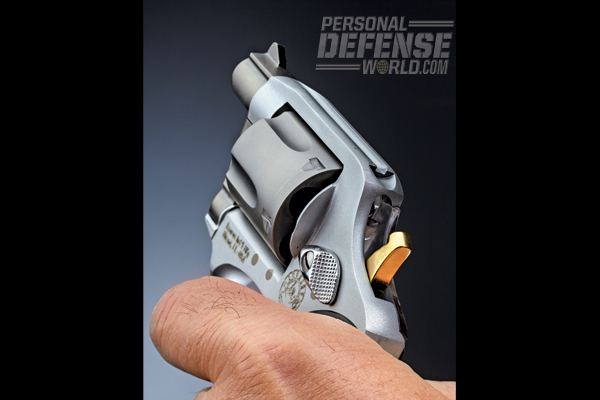 In keeping with its role in life as a concealed-carry handgun, the Taurus View has a spurless hammer, and the lock work has been modified so it can only be fired in DA mode. 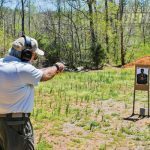 According to my trigger-pull gauge, it took 10.5 pounds of finger pressure to pull the trigger through a full stroke, a task greatly facilitated by the trigger’s smooth, brightly polished face. 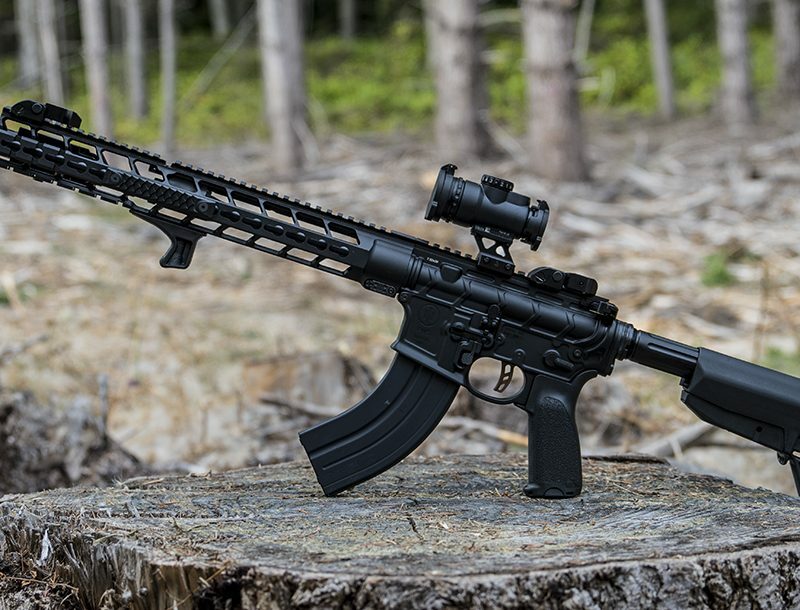 The grip frame has been pared down to what, in my opinion at least, is the smallest size possible while still providing a secure purchase and manageable level of recoil control, but more about that later. It is obvious that a great deal of thought went into its contour so as to reduce “signature” when the View is carried concealed under light clothing or in a pocket. 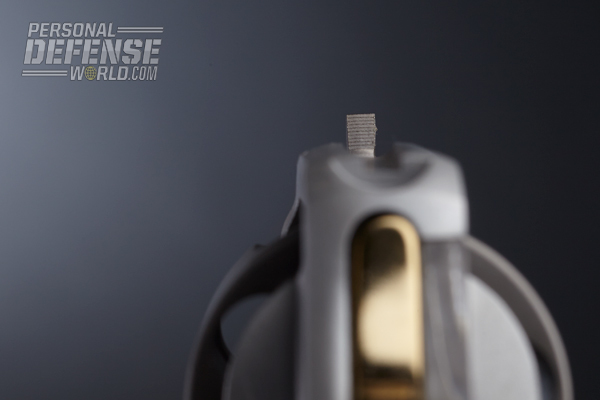 A serrated blade up front and a square groove in the top strap serve as sights. They are basic in the extreme—nothing short of massive structural damage is going knock them out of alignment! 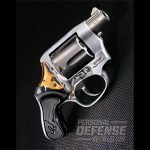 As do all Taurus revolvers, the View has the Taurus Security System, which allows the shooter to lock the hammer and trigger to prevent unauthorized firing. This is accomplished by inserting a key (two are provided) into the lock, located on the rear of the hammer, and rotating it clockwise until you hear a click. To unlock it, simply insert the key and rotate counter-clockwise. I was quite anxious to get a sample Taurus View to test. After all, it’s the most unique departure from traditional DA design in some time. When the box arrived from Miami, I hurriedly opened it, whereupon my fiancée (and photographer) Becky commented, “Now isn’t that the cutest thing?” And while I muttered the usual male groan of exasperation as I handled the View, I had to admit it was sort of “cute.” Ahem…OK, let’s get back to work! 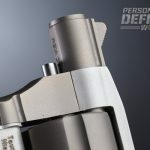 While handguns such as the View are designed to be used at “reach out and touch someone” distances, COMBAT HANDGUNS’s test protocol demanded that I test fire it for accuracy. Considering its tiny grip and basic sights, I decided to perform this task (feat?) 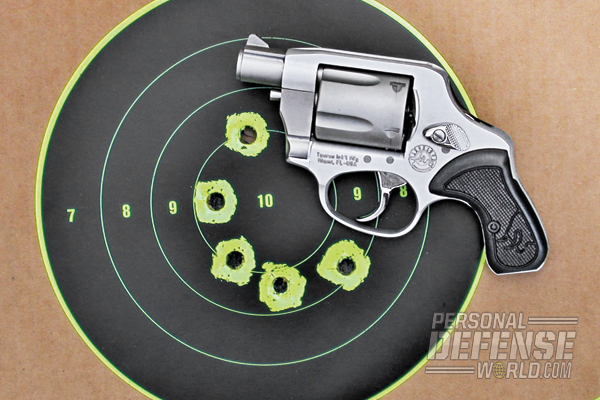 from an MTM K-Zone rest at the practical distance of 7 yards. 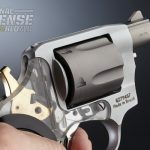 As Taurus recommends against the use of +P or +P+ ammo in the View, I scrounged around the landfill I call my storage closet and found four brands of .38 Special that I felt would be suitable for such a diminutive revolver: Hornady 90-grain Critical Defense Lite, Winchester standard velocity 110-grain Silvertip, American Eagle 130-grain full metal jacket (FMJ) and some Remington 148-grain wadcutter target loads. I must admit up front that, with the View’s tiny grips, short sight radius and DAO trigger, this stage of the test firing proved a bit of a trial. But I persevered and produced a dozen groups ranging from just under 3 inches to a bit over 4 inches in size. The short ejector rod ejected spent cases only partially from the cylinder; to remove them completely it was necessary to employ finger power. The View performed best with the slow-moving Remington wadcutters. 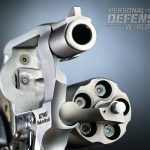 While these are not generally considered a defensive load, they tend to produce “cookie cutter”-type wounds, which can let out a lot of blood quickly, and for that reason might be a good choice for this type of revolver. 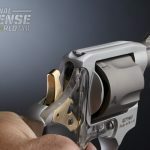 On the other hand, the fast-stepping Hornady Critical Defense Lite might produce enough velocity for the bullet to expand. Off-hand drills were performed at 3 and 5 yards (remember what I said about “reach out and touch someone” distances?) with acceptable results. 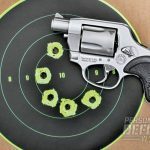 The View’s tiny grips and light weight made for some pretty snappy recoil, which, by the end of the range session, verged on the painful. 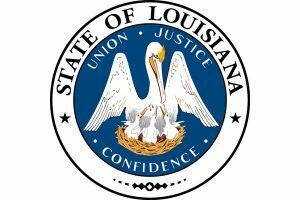 Firing approximately 100 rounds, we did not experience a single malfunction. Can I make any recommendations about the Taurus View? Only two. 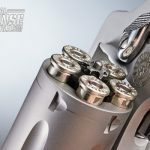 I believe larger grips would greatly improve recoil control and accuracy without sacrificing much in the way of concealability. The same can be said about a longer ejector rod. 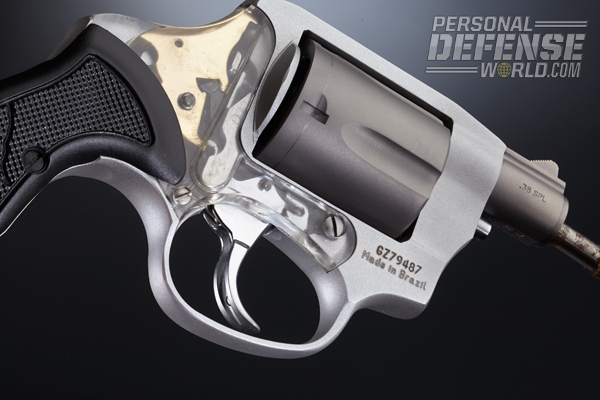 The View was designed as an ultra-concealable, close-range, last-ditch-type defensive handgun. 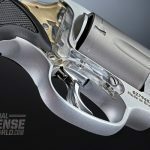 It’s a mission the revolver accomplishes with aplomb, but I don’t think the average owner is going to do much practice shooting with it. 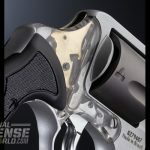 But, it was cool viewing the interior of the revolver in action.